Join the Acadia to Katahdin: 2018 Maine Sea to Summit Virtual Edition! Filtered for #moose. Back to unfiltered. #4 ultramarathoner. #5 runner. Longest personal streak grows to 366 days at 5.24 miles/day. Wow! Congratulations on that streak! #4 ultramarathoner. #5 runner. Longest personal streak grows to 365 days at 5.24 miles/day. #4 ultramarathoner. #5 runner. 8th Longest personal run of this race this month. Longest personal streak grows to 363 days at 5.25 miles/day. #4 ultramarathoner. #5 runner. Longest personal streak grows to 362 days at 5.26 miles/day. #26 ultramarathoner. #37 runner. 9th Longest personal run of this race this month. Hey, I need to add this pipeline mileage too. My #lobster half to your #moose half - half mile, that is. #4 ultramarathoner. #5 runner. Longest personal streak grows to 360 days at 5.27 miles/day. #4 ultramarathoner. #5 runner. 6th Longest personal run of this race this month. Longest personal streak grows to 358 days at 5.28 miles/day. #32 ultramarathoner. #42 runner. 8th Longest personal run of this race this month. #4 ultramarathoner. #5 runner. Longest personal streak grows to 354 days at 5.29 miles/day. Another great hike in December in Acadia NP, this time to the peak of Cadillac Mountain along the summit road, so peaceful with no motor vehicles and an empty parking lot on top. We enjoyed watching another winter visitor, a large snowy owl, which was perched on tree tops at the peak. #25 ultramarathoner. #37 runner. Extends streak to 4 days. Longest personal run. #4 ultramarathoner. #5 runner. 7th Longest personal run of this race this month. Longest personal streak grows to 353 days at 5.30 miles/day. #30 ultramarathoner. #42 runner. 10th Longest personal run of this race this month. 3rd Longest personal streak grows to 16 days at 7.12 miles/day. #moose Ran the half and then did a fair amount of walking cheering on friends after.💗💗💗Millinocket is so special. #3 ultramarathoner. #4 runner. 6th Longest personal run. It was great to share a few miles together today! Congrats on your 2:35:40 finish today in the Half Marathon in Millinocket. Shots? Now I really AM jealous! Sounds like I need to put this race on my calendar for next year! Congratulations! Sorry to miss you at the Sawmill @KPS - but so glad you got to share a few miles with @KDDID. Since @KDDID, who is on team #lobster, wore a moose suit, did you, as member of team #moose, wear a lobster suit? @AOMM Ha! My face was as red as a lobster if that counts! #moose Wonderful day to run in Millinocket! #4 ultramarathoner. #5 runner. Longest personal run of this race this month. Longest personal streak grows to 350 days at 5.32 miles/day. Kudos for your 2:16:33 finish in the Millinocket Half! And great to meet you today! @4000footer Great to me you as well! Thanks, not my fastest Millinocket time, but happy the knee held out. Such a fun day. Great to meet a #MonsterMoose club member at the Moose Drop In and present you with your medal! And what a precious photo we have of you and your coach, Tricia, wearing your respective medals! @AOMM Can you share photos? Would love to have copies! #30 ultramarathoner. #42 runner. 3rd Longest personal streak grows to 15 days at 7.48 miles/day. 7th Longest personal run. #MonsterMoose - sorry to miss you in Millinocket! #4 ultramarathoner. #5 runner. Longest personal streak grows to 349 days at 5.30 miles/day. Good luck - have a blast! Bib #42 Have a great run! Bib #47 up front, racery bib #10, "Hello my name is @AOMM in back. #42 runner. Finished in 42nd place. Congratulations on the finish! Will be tallying up Round #4 #moose vs. #lobster shortly, and will be announcing Round #5 shortly. Race has been extended until at least Dec. 31, and gift giveaway drawing results being announced soon. @Mamaof7Dogs - I'm putting into the team spreadsheets the 26.2 miles in Millinocket, 50-50 #lobster and #moose. Great to meet you and run about 0.5 mile with you, and present you with the one-of-a-kind #MonsterMoose - #lobstrosity medal. This race has been extended until at least Dec. 31, and maybe 100 days into 2019 and beyond as well. So keep logging those miles and putting up interesting photos on racery! And so nice to meet Heidi too - what a great friend! #46 runner. 3rd Longest personal streak grows to 14 days at 6.84 miles/day. Passed 1 runner. #47 runner. 3rd Longest personal streak grows to 13 days at 6.88 miles/day. Looks like you'll be finishing atop Katahdin same time you'll be running Millinocket? Virtual race medal ceremony at the Sawmill on Saturday, 5:30 to 7 p.m., and if you can't make that, look for us at the mini golf fundraiser for the library on Saturday about 2:30 to 4, or over at Team #moose headquarters at Moose Drop In around 4:15 to 5:15. #4 ultramarathoner. #5 runner. Longest personal streak grows to 348 days at 5.31 miles/day. #47 runner. 7th Longest personal run of this race. 3rd Longest personal streak grows to 12 days at 7.17 miles/day. Passed 3 runners. 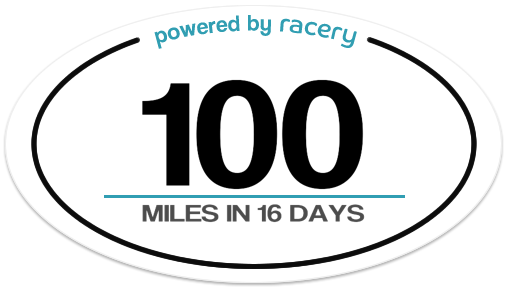 Ran 100.0 miles (+2.7 miles) in 16 days a PR. #4 ultramarathoner. #5 runner. Longest personal streak grows to 347 days at 5.31 miles/day. That's it. Thirteen miles to go. Conveniently I have a little 13.1 mile run scheduled for Saturday. Looking forward to presenting you your virtual race medal ceremony at the mini-golf fundraiser for the library on Saturday, where I'll be around 2:30 to 4. If I'm running a little late, it's because I'm still thawing. Tag me here or on the Facebook group page if you don't see me (but don't use Facebook messenger, as I don't have the app on the phone). Maybe a round of mini-golf will warm us all up, #lobster vs. #moose. #4 ultramarathoner. #5 runner. Longest personal streak grows to 346 days at 5.32 miles/day. #48 runner. 10th Longest personal run of this race. 5th Longest personal streak grows to 11 days at 7.04 miles/day. Passed 4 runners. Wish Golden Road would look like this on Saturday. #52 runner. 7th Longest personal streak grows to 10 days at 7.03 miles/day. #4 ultramarathoner. #5 runner. Longest personal streak grows to 345 days at 5.33 miles/day. Too bad no photo of A. Murray Young Path on Google Street View. #52 runner. 7th Longest personal streak grows to 9 days at 7.13 miles/day. #moose Last double digit until Millinocket Half! #4 ultramarathoner. #5 runner. Longest personal streak grows to 344 days at 5.33 miles/day. #MonsterMoose on Acadia Park Loop Road! #52 runner. Longest run in race this week. 8th Longest personal streak grows to 8 days at 7.15 miles/day. #3 ultramarathoner. #4 runner. 7th Longest personal streak grows to 8 days at 6.02 miles/day. At first thought you were staying at a Days Inn in Boston, when clicking on your Google Street View! #4 ultramarathoner. #5 runner. Longest personal streak grows to 343 days at 5.32 miles/day. #3 ultramarathoner. #4 runner. 9th Longest personal streak grows to 7 days at 6.31 miles/day. Nice view of Sieur de Monts spring house! #52 runner. Extends streak to 7 days. #52 runner. Extends streak to 6 days. #4 ultramarathoner. #5 runner. Longest personal streak grows to 341 days at 5.33 miles/day. #moose indoor track this morning. That's a lot of circles. #3 ultramarathoner. #4 runner. Longest personal streak grows to 6 days at 6.68 miles/day. Wow. Surprised you weren’t dizzy! @FL2ME I know! I wish I could switch directions every mile but the YMCA has everyone going in the same direction each day. It's 13 times around for a mile. I was counting at first but I turned on my Garmin on the "run inside" mode and it was accurate. Thank goodness! That sounds about the size of the indoor track at my college - and it was suspended over the gym, at quite the angle. But that was in the day before GPS watches, so had to keep count in my head. #4 ultramarathoner. #5 runner. Longest personal streak grows to 340 days at 5.34 miles/day. #52 runner. 4th Longest personal run of this race. Longest run in race this week. Extends streak to 5 days. #52 runner. Extends streak to 4 days. Passed 1 runner. #4 ultramarathoner. #5 runner. 5th Longest personal run of this race this month. Longest personal streak grows to 339 days at 5.35 miles/day. #3 ultramarathoner. #4 runner. Extends streak to 4 days. #4 ultramarathoner. #5 runner. Longest personal streak grows to 338 days at 5.34 miles/day. #53 runner. 5th Longest personal run of this race. #moose Had to run today Millinocket in 13! #4 ultramarathoner. #5 runner. 4th Longest personal run of this race. Longest personal streak grows to 337 days at 5.35 miles/day. #3 ultramarathoner. #4 runner. 9th Longest personal run of this race. Nice view of Penobscot. Interestingly, the sign for the summit is still missing. #moose 4 degrees this morning and very windy. Happy Thanksgiving! #4 ultramarathoner. #5 runner. Longest personal streak grows to 334 days at 5.31 miles/day. Cold Thanksgiving run. Temp is 3 degrees feels like -15! #7 ultramarathoner. #13 runner. 7th Longest personal run of this race this month. 5th Longest personal streak grows to 7 days at 6.15 miles/day. You must keep us up to date on the Millinocket-area conditions, for those of us also in training for real-life Millinocket! Happy Thanksgiving, and these miles will be in the updated #moose spreadsheet for today. #35 runner. 10th Longest personal run of this race this month. Extends streak to 8 days. Passed 1 runner. No, just shy of Katahdin today. #lobster trot tomorrow! @CindyLouWho - #lobster roll an alternative to turkey trot! Not sure what to call the #moose alternative, but leave it up to that team to come up with a catchy phrase. #53 runner. 5th Longest personal streak grows to 11 days at 6.87 miles/day. #3 ultramarathoner. #4 runner. 10th Longest personal run of this race this month. EZ miles on some icy roads in 28° temps. Even in the dark, the snow-covered 'ghost' trees were gorgeous. #6 ultramarathoner. #6 runner. 4th Longest personal streak grows to 27 days at 4.76 miles/day. Hey, you're near #moose HQ, a.k.a. Moose Drop In where honorary #moose coach Tricia Cyr holds court. Think we will "drop in" at the Drop In during Millinocket Marathon weekend to present medals to members of #lobster and #moose and buy some s**t.
@AOMM I'm sorry I won't be in Millinocket this year - have a blast! #53 runner. 4th Longest personal run of this race. 6th Longest personal streak grows to 10 days at 6.84 miles/day. Passed 1 runner. Within half a mile of being #MonsterMoose - you have until this Saturday in this 3rd round to do 10 in one day, or Round 4 that starts on Sunday. Happy Thanksgiving! Of course, you did make #MonsterMoose on Nov. 3, and as that is the kind of elite club that has a lifetime membership, you are permanently part of the club! #4 ultramarathoner. #5 runner. Longest personal streak grows to 332 days at 5.31 miles/day. #4 ultramarathoner. #5 runner. 6th Longest personal run of this race this month. Longest personal streak grows to 331 days at 5.31 miles/day. #53 runner. 8th Longest personal run of this race this month. 6th Longest personal streak grows to 9 days at 6.54 miles/day. Passed 1 runner. Ran 100.0 miles (+3.2 miles) in 17 days a PR. #3 ultramarathoner. #4 runner. 10th Longest personal run of this race. #4 ultramarathoner. #5 runner. Longest personal streak grows to 330 days at 5.32 miles/day. #54 runner. 7th Longest personal streak grows to 8 days at 5.90 miles/day. Passed 1 runner. #35 runner. 2nd Longest personal run of this race this month. Welcome, hello, and congratulations on the quick finish to Katahdin! If you're running Millinocket, we can either present the medal to you there, or we can mail it to you today or tomorrow. As you're new to the race, just wanted to let you know about a #moose vs. #lobster subchallenge we have going on, details at this Facebook group post: https://www.facebook.com/gr... If you wanted to be in on Round #4 of the challenge that is going on now through Dec. 8, all you need to do is let me know which team you are on, and I can add you to the team spreadsheet. Your 10 miles-or-more-per-day entries qualify you for either the #MonsterMoose or lobstrosity elite clubs (there's a Stephen King theme to this race to, and that's why lobstrosity). And there's the option of a team medal, photos in the above Facebook group post. You can keep logging your miles through Dec. 8 even if you've finished atop Katahdin already. Again, welcome and congratulations! #55 runner. Extends streak to 7 days. #55 runner. 8th Longest personal run of this race. #moose getting some winter running for millinocket run! #55 runner. Extends streak to 6 days. Passed 2 runners. #57 runner. Passed 1 runner. #58 runner. Extends streak to 5 days. Passed 1 runner. #3 ultramarathoner. #4 runner. 7th Longest personal streak grows to 8 days at 4.91 miles/day. #59 runner. 10th Longest personal run of this race. Extends streak to 4 days. You need to validate this device to log activity. If you haven't already, join here! You need to validate this device to chat. **Note, you need to be in the race to chat on the Messageboard! If you haven't already, join here! When does this race end? Actually, just got it extended (you're the first to know), and will be making formal announcement soon. Thanks for continuing to log your miles and being a great contributor, @CaptDave, both here and to the Acadia National Park Hiking group page on Facebook as well! Anyone headed for Boston next weekend? I'll be volunteering again (14th year) in the start corrals (don't know which one yet). Look for the guy with a grey beard in the bright orange cap. Wishing tailwinds and big grins to all the racers. @Coastwalker I'll be spectating...arrive Friday pm and we'll head home Tuesday morning. At my usual post...in front of the Hines @ Hereford & Boylston. @Coastwalker Just checking to see if anyone needs some logistical support. @JohnT is running it, for charity. And @RosaPup is volunteering at the 40k mark, I think. And alas, I am on tax prep deadline, being in the business I'm in, so sorry can't be there to give real-life cheers. I’m in the 4th wave, 5th corral. I’ll be wearing a shirt my charity made for me with my first name printed across the front. White with blue font (long sleeve) or blue with white font (short sleeve). Also have a salt and pepper beard and blue North Face cap. @JohnT What's your bib number? Just shared the latest news about fellow virtual racer @Fossil on the Facebook group page: https://www.facebook.com/gr... She's famous! I forget. What is the finish line mileage?? @RangerMo and @KDDID - to reach Katahdin the first time, it is 337.8 miles. Anyone running the Downeast Sunrise relay this year? Anyone want to make a team or any teams in need of another runner? I would love to be part of this but do not have running friends who are interested. I'm in for the 5th time. Team Chowda Heads. Team's not filled yet...I'll keep you posted. Still having issues with attaching photos. I have an android and post directly from that. I click on camera icon, then files, choose a photo, then nothing. So I submit without the photo. One time it worked, so what am I not doing now? Hi @RangerMo sorry didn't see this earlier, about the photos. Let me try experimenting next time from my phone, a Samsung, and see if I can figure it out. Weird it worked that one time, but not since.